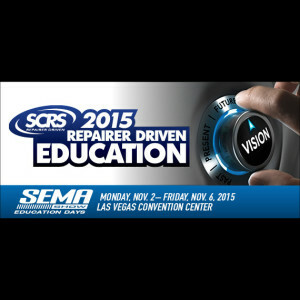 The Society of Collision Repair Specialists has released its 2015 SEMA Repairer Driven Education schedule, which will include new morning classes requested by past attendees. Each regular and OEM Collision Repair session Nov. 3-6 is $75 in advance and $85 after the Oct. 16 early-bird deadline or at the door. An invitation to the SCRS Sky Villa after-party Nov. 5 is $85/$100, and a pass to everything SCRS offers during all four days is $375/$400. However, space is limited at the OEM sessions, so repairers might not want to wait until the final early registration discount date to sign up for those Nov. 5 classes. In coming months, we’ll seek some of these SEMA presenters’ insights in our coverage, so keep an eye on our site. We’ll also be at some of these courses in November, and telling you in real time what’s happening through our @repairerdriven Twitter feed. For now, here’s the schedule and a reason to enroll from each course description. Classes are all 120 minutes long aside from free lunchtime courses; you pick one per two-hour time slot. Why you should go: Hoerner will “analyze the scheduling process – or lack of” at collision repairers and show you how to improve if you’re in the “lack” category. Why you should go: “Attendees will learn about creating successful compensation strategies that work in a lean collision repair shop” besides just paying a technician a flat rate. Why you should go: “The goal of this discussion is to provide concrete advice and suggestions from industry peers with first-hand experience” at growing business. Why you should go: “The session will focus equally on the procedural aspect of the panel joining process as well as the safety considerations that should be considered for the workers, the environment and the repair” of high-strength steel, aluminum and carbon fiber. Why you should go: “Learn how to approach welded replaced components and make sure you are capturing all necessary elements” in repair planning. Correction: This article has been updated to reflect changes in the OEM Technology Summit.